Before Governor Samuel Ortom dumped the All Progressives Congress, APC, for the Peoples Democratic Party, PDP, last August, rumour mills had it that he had a running battle with his political godfather and leader of the party in Benue State, Senator George Akume. It was therefore not a surprise to many when he dumped the party after raising the alarm that Akume had issued him a red card, meaning he was no longer needed in the APC. 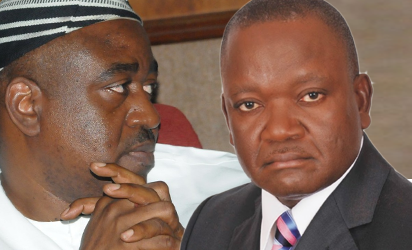 Ortom’s defection to the PDP practically meant that he was left with no other option than to work with his predecessor, former Governor Gabriel Suswam with whom he had been at loggerheads since assuming leadership of the state in 2015, ostensibly fuelled by Akume, their political godfather, who had a hand in their emergence as governors of the state at different times. Thus, Ortom and Suswam have elected to forget the past and teamed up to oust a common enemy. And the first step to prepare a formidable political onslaught against the Akume dynasty, after supporting Ortom’s re-entry into the PDP, Suswam also supported Governor Ortom to pick the PDP governorship ticket. The duo who friends before the 2015 elections have found their political groove again and are determined to retire Senator Akume from the Senate on account of non-performance. So far, the PDP senatorial candidate for Benue North West district and serving federal lawmaker, Mr. Orker Jev, has continued to enjoy support from the entire PDP family including Ortom and Suswam who obviously felt that their estranged political godfather deserves retirement from the Senate after three terms of 12 years at the end of the current dispensation. Governor Ortom while applauding the PDP for picking him as the governorship flag-bearer of the party in the 2019 election said his emergence had put an end to godfatherism in Benue politics. Obviously referring to Senator Akume and his alleged overbearing influence on political allies, Ortom lamented that such acts were responsible for the below par performance of those entrusted with leadership responsibilities because political godfathers would not allow such persons space to perform. It is however left to be seen if Senator Akume would survive this double barrelled onslaught unleashed by two formidable political allies who are determined to change the political narrative in Benue.